Always have a backup. That's up there with wear your seatbelt, eat your vegetables, and always have cab fare on a first date. OpenOffice.org has a backup system that lets you create a backup copy of your documents, anywhere you want. Not a bad idea, eh? Here's how you do it. 1. Choose Tools > Options > Load/Save > General. Mark the checkbox for always making a backup. 2. In the same big window, open the OpenOffice.org category. Click the Paths option and select the Backups item. This is where the backups will be created. If that's fine, leave it as is. If you want the backups elsewhere, click Edit, specify the new location, and click OK.
3. Click OK to save all the changes you made in the settings window. For every new document you create, then each time you edit that document, a backup of the previous version will be created. Your backups will be created with a BAK extension in the location you specify. I know I should probably be using Nvu or just hand coding everything in HTML or using cascading style sheets. But for those of us who still redesign our web sites on Saturday morning while listening to Car Talk and Wait Wait, Don't Tell Me, I wanted to talk about what I did for my site at www.getopenoffice.org. Since it worked out pretty well, to my not-that-artistic mind. At least, it's vaguely pleasant and not Five Bright Colors of the Same Shade. Click to see a bigger version if you like. I was pretty happy with what I was able to do, how I was able to design the colors, and I'm stoked with the image map. It turned out in a far more normal, controlled way than I usually experience. So for all of you out there who are a little fuzzy on web design but do it anyway, here are some features I think you can use for some pretty decent results. I'm not here to talk about how FAAAbulous the new design is, but to focus on the steps I used in OpenOffice.org to do it. It's also by no means a lesson on web design—I'm just showing what I was able to do in a morning (OK, a long morning) in OpenOffice.org, and hoping it helps other people. By the way: I'm sooooo sorry for the bright blue design at www.getopenoffice.org for the past few months. I got the templates from a free templates site and it just didn't work. Side story: Kristin started her literary agency maybe four years ago, and she lives in Denver, not New York. She's made incredible progress, including selling the film rights to many of the books. If you've got some marketable fiction and you're looking for an agent, consider her. So, armed with the ideas “maroon!” and “taupe!” and figuring I would just use the same simple top/side navigation style, I continued to the beginnings of implementation. One of the wonderful things about OpenOffice.org is that you can create your own colors. So I chose Tools > Options > OpenOffice.org > Colors, and created my maroon and my taupe. The far right color, and the ones on the bottom, are various colors I created for the site. I did various shades of maroon, a lighter one for a bit of shadow and contrast, and a few different taupes for the nav area, the text in the nav area (nearly black), and other taupes for shading and for the background color of the page. 1. Choose Tools > Options > OpenOffice.org > Colors. Click on the Edit button in the colors window. Click the image to see a bigger version if you like. 2. Then mess around in those windows with the various settings til you get what you want. 3. Then click OK, click Add, and name the new color. I went into OpenOffice.org Draw and after some fiddling with colors and fonts, came up with the navigation graphic, including all the text along the left and top. It's in two separate chunks, for the top and the left side. I used this beveled rectangle tool to draw the navigation shape at the top, and just used a couple graphics behind each other in different colors for the other shading. I exported each of the two graphics just by selecting the components of each, choosing File > Export, and exporting to .gif. Other options of course are JPG, PNG, etc. I created a new web page (File > New > HTML Document). I inserted an eight-inch-wide table in the center (well, kind of ;> ) of the document to control where the graphics and text go. The table was two rows and three columns, no heading, with a left column of 2 inches, a middle spacer column of 1 inch, and then the rest. Click to see a bigger image of the setup window here if you like. Then I merged the top row of cells, where the top nav graphic is going, to end up with something like this. And I also removed the table borders. I just chose Insert > From File and added the top graphic in the top merged row, and the left graphic in the left cell. I right-clicked on each graphic and set it to Original Size since there was some wackiness with automatic size reduction. I also right-clicked on each graphic and choose Anchor > As Character to get rid of extra space below them. Some extra white space showed at the bottom of the nav bar because of the formatting of the apparently nonchangeable Table Contents paragraph style. However, this wasn't an issue when browsing the document. I also set the background color of the cells to match the graphic in them; the spacer and right lower cells were set to white since they'll have text and I want a white background. And I set the page size nice and big so that there would be plenty of room for the graphics. Same window, Format > Page and choose the Page tab. I right-clicked on the top nav bar graphic and chose Image Map. In the Image Map window, I used the rectangle tool to draw a box around each piece of text on the graphic that I wanted linked, and entered the URL It's a little odd—you have to draw the box around the image in the window, so it's a little small but manageable. Then I did the same for the left nav bar. You end up with nothing happening to the graphic itself, but a bunch of code in the document with the tag MAP1, MAP2, etc. The code gives the coordinates of the links. That means of course that you don't change anything that would shift the graphic up or down or left or right, once you get this done. The image map would have been too small to see in this window if I had used the full length one here for the editing. I kind of cheated—I used a short version of the left nav graphic in the beginning, then created a much longer one in Draw and inserted that after the map was done. Since the only thing that changed between the short graphic and the long graphic was the bottom, where there are no links, this didn't affect the image map. Nothing shocking here. I pasted in the content from my old site, creating a new page with File > Save As. Posted the pages. Did some retweaking. Heck, I didn't even use the Web Wizard. 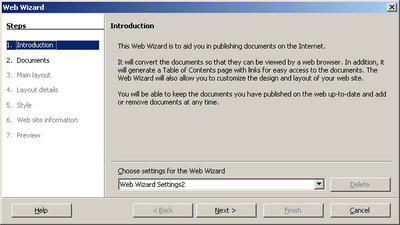 (File > Wizards > Web Wizard.) That tool of course is more for quick “just get it on the web” work when you have a lot of existing content to slam up on the web. So....who should be using these tools versus Nvu, DreamWeaver, handcoding, better overall extensible design, etc.--well, I'm not debating any of those issues. Just wanted to show you what was available, and let you know you might be surprised at how much cool stuff you can do without a huge headache. Note: Here's a related article I wrote for TechTarget.com. First published November 2005. To make the graphic lighter, select it. The Picture toolbar should appear but if it doesn't, choose View > Toolbars > Picture. Use the Lightness icon to make the graphic lighter. I've written an article for TechTarget on the general theme of using the customization tools in OpenOffice.org to make life better for users. Whether they're just using OpenOffice (or StarOffice), or switching from Microsoft Office, you can customize toolbars, menus, and keyboard shortcuts to make life easier. Here's how it starts--thanks to Louis for the story and to Scott for his pivotal role. "One of my blog readers reports that, when he migrated his organization to OpenOffice.org, he didn't even tell the users that they were switching to a different office suite. He just said that there was going to be a big upgrade. Then, he and his migration cohorts modified the OpenOffice.org menus and toolbars to resemble the Microsoft Office layout and phrasing as much as possible (without violating copyright, of course) and gave that configured version to the users. He reports very few problems with the migration. "I love that story. Is the biggest problem with change simply that it is change?" This isn't totally new content since I've done a similar blog post, but it's very useful stuff. It's about AutoText and automatic formatting options, so that you can create shortcuts of special characters, a signature, standard legal text, graphics, or several pages of all of the above. You can use the keyboard or insert them with the mouse. I'm such a dyed-in-the-wool menu user that I often ignore the very useful icons on the Standard toolbar in OpenOffice.org. This is the toolbar, usually at the top of your work area; click the picture here to see it fullsize. Some of these icons are only in Writer, or only in Calc. See the end of this post for what to do to add icons that you don't see but think should be available. Mail Merge (the simple one) - You can get to it without adding it to your menu, by clicking this icon. Pasting - The Paste icon is fine but you can click and hold down on it, and get extra options which are nice when pasting between different applications, or when you want the pasted content to be linked to the original. The options vary depending on what and where you copied, and where you're pasting. Page Preview - You can choose File > Page Preview too, but this is quicker. Data Sources - Click the Data Sources icon instead of choosing View > Data Sources. Then you'll see your actual data sources, as you'd expect. Click to see a bigger version. Zoom - Click Zoom to see a bigger version of your document (or a smaller version). When you click that icon, you get this window. Show Draw Functions - You can choose View > Toolbars > Drawing, but this is a lot quicker. Here's the toolbar you get. 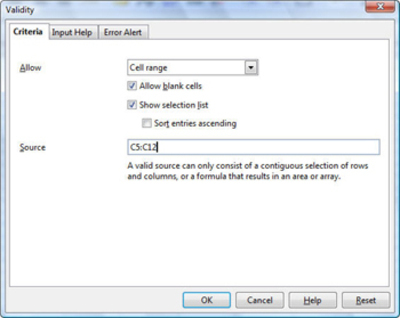 Sort Ascending, and Sort Descending - Select cells in your spreadsheet and use these icons to sort quickly. Navigator - Click this icon to see the Navigator, a very useful tool for seeing what's in your document, and going to different parts of it. It's most effective with larger documents. New Document From Template - This is much quicker than choosing File > New > Documents and templates. You get the same window you'd expect. New Document - This is a little easier than choosing File > New. Click and hold down on the icon to get the choices. Table - Just click and hold down on this icon and choose the dimensions of your table. Show Nonprinting Characters - To show things like carriage returns and tab marks, click this icon. Here's what they look like, showing (they don't print). Click and hold down on the downward-pointing black triangle on the standard toolbar. Then find anything without a checkmark next to it, and select it to add it to your toolbar. To make sure you have room for all the icons, select anything with a checkmark that you don't want, and hide it. I'm back from a fun week of training in Frankfort, Kentucky where I learned more about desktop support, what to wear to the Derby, and "Doctor Hobo" than I ever dreamed possible. Here are a few things we talked about implementing that I wanted to reinforce as very useful--especially if you have a lot of users who might not be wild about the change, and want to help ensure consistency and ease-of-use. Templates, templates, templates! Make the templates, set'em up in clearly named categories, and point users at them. For best results, store the templates centrally on a server. To make a template, choose File > Templates > Save, or just copy it to the templates directory of your OOo installation on the server. To point users to that location, choose Tools > Options > OpenOffice.org > Paths, select the Templates line, click Edit, and add a location. See more in this blog on templates. Configure the menus and toolbars! You can make menus that say "Admissions Department" and it's not going to take any training at all to get the folks in the Admissions Department to use that menu. Then stick whatever you want in there. 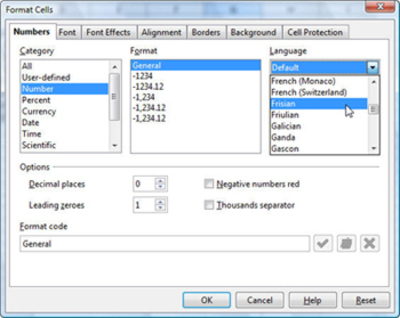 Choose Tools > Customize to modify or create menus and toolbars. When you add items, you can choose to rename the menu or toolbar item so that it says "Use This For Printing Envelopes" or even "Diane, This Is For You". See more in this blog on toolbars. To skip blank Address2 lines, just use the mongo mail merge wizard: Tools > Mail Merge Wizard. This is a bit complex so just set it all up with the content and the database users need, then make a template and point them to the template. You might need to fuss with the database setup to be sure that the users' systems recognize it if you've got the template and database on a central server; one thing to try is Tools > Options > OpenOffice.org Base > Database and register the database. See more in this blog on the big wizard. If you have a lot of forms with fill-in fields (the usual gray fields that pop up to let you enter something), consider creating a form from File > New > XML Form Document. This gives you the data entry form tools but you can use them easily for forms that just need to be filled in and printed, or filled in and saved. You can create dropdown lists for instance that make it easier for the people filling in the fields to know what the correct possible values are. When you create the form, make it a template too, then point users to it. Here's a blog on tweaking forms created with the wizard, which isn't exactly what you might want but it's a step in the right direction. Those were the big implementation ideas that we bandied about and I think are darned useful for anyone who needs to work with a lot of users. If you have other ideas along these lines, let me know! I always learn something when I teach a StarOffice or OpenOffice class. In Green River, Wyoming two weeks ago, I learned how to redock the slide pane in Impress/Draw (for some versions of the software). Click here to see the post. I also learned that cleaning the dash on a Subaru can knock your hazards on, and they don't flash so it looks like they're your regular lights. I also learned that Green River Imports is a very fine car-fixing establishment that doesn't laugh at you when you bring in your car for something like that. This week I'm in Largo, Florida at the City of Largo. The weather is gorgeous. I'll post pictures when I get back. I'm teaching an all-Linux set of classes this week--notable, the City of Largo completely skipped Microsoft Office. Never had it or Windows running for the city. Fabulous. - You can just click somewhere in a table, then choose Table > AutoFormat, to apply an autoformat--you don't need to select the whole table. - When you're putting spacing between columns under Format > Page, Columns, or for a section too, it won't accept a space between the columns if you type the measurement. You have to use the arrows to put in the spacing. - I should have seen this earlier but in mail merge documents, you need to specify the printer before you print. 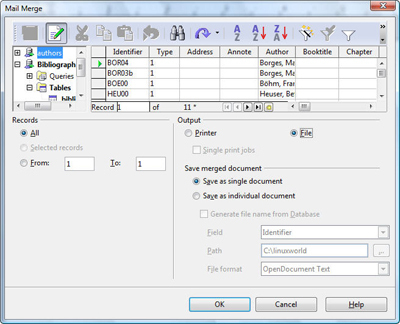 In labels or envelopes just click the Options tab and specify the printer. 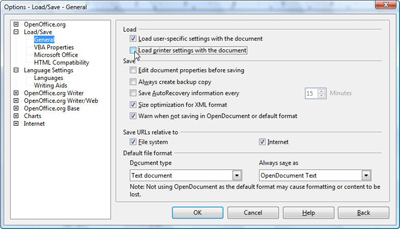 Or in any created document, choose File > Print Properties and select the printer. Then choose File> Print, click Yes to print a form letter, be sure the Printer radio button is selected, and click OK. Used to be, you got a chance after that window to specify the printer. Not anymore. - The mail merge wizard in 2.0.1 now does let you do manual editing when you set up the contents and layout of the address block, so it's now less annoying. - To sort a data source for mail merges, so that for instance everything prints in order by zip code, here's what you do. 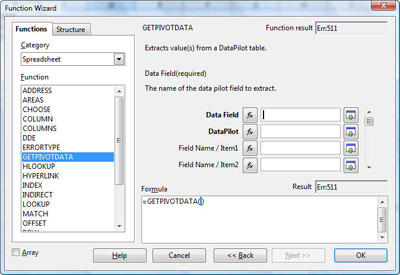 Choose File > Open to open the data source, the .odb file. Double-click the table you're basing the mail merge on. In the editing window, click the column you want to sort by, and click one of the sort icons, Sort Ascending or Sort Descending. Then do your mail merge. If you need to then change the sort for another mail merge, just repeat these steps. - I've been reminded that it's not a bad idea to just export your Impress slides to PDF and run your presentation in Adobe Acrobat. (In OOo, File > Export as PDF.) For anyone looking for an OpenOffice.org Impress viewer application, PDF might be all you need. Granted, it won't run your cool effects but unless you're presenting on something where you need to demonstrate motion, you don't technically need custom animation or slide transitions. You can of course also export to HTML and to Flash; I haven't played enough with Flash to know how the transitions come over, if at all. - Hyperlinks transfer over to PDF!!! This did not happen in 1.x. 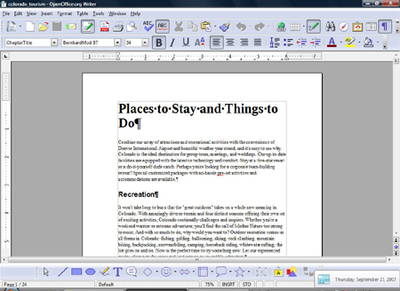 However, in 2.0 OpenOffice.org, any hyperlink in a document such as a hyperlinked table of contents or any link period, transfers to the PDF when you choose File > Export as PDF. This is GREAT. 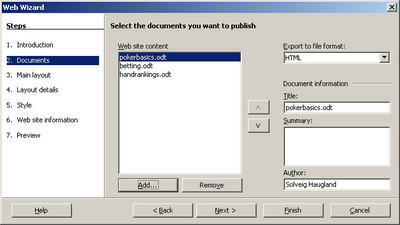 To create a plain old hyperlink, select some text to link and click the Hyperlink icon on the top toolbar. - In labels, to go from one frame to another on the keyboard (or to go from one label to another, period), press Esc Tab Enter. Intuitive, huh? You can also choose Tools > Customize, click Keyboard, and set up a control key for it. I'm cleaning up my blog's sidebar areas, and categorizing posts. This post is one of the results--linking directly to an article on TechTarget.com. I wrote an article for TechTarget.com on the new toolbars in OpenOffice.org 2.0. Note: See also a related article I wrote for TechTarget.com. I've been updating my workbooks to OpenOffice.org 2.0. One of the big differences is the look and feel, i.e. the toolbars. They have different icons to show you how to see the whole toolbar, and you view them differently. It's not hard, but it's definitely different than 1.x. So here's an excerpt from my OpenOffice.org 2.0 Core Office Suite workbook that describes how to do a bunch of stuff with the new toolbar system. 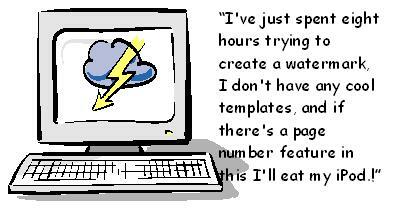 Starting to use a new piece of software, especially when you're used to a different one that you loved that was mercilessly taken from you by Earl the IT guy, can be a little confusing. Here are a few of the things new users encounter the most, from troubleshooting and a little confusion to frequently asked questions about how to make the software do what you want it to. Don't worry about the JRE unless you're making databases. The install for 1.x will ask you where your JRE is. If your reaction is to think, well, maybe you left it in your other pants, or that Dallas was cancelled years ago, don't worry about it. Just say you're not using one. If you end up wanting one later, you can get it from Sun (java.sun.com) or for OpenOffice.org 2.0 you can download the Windows version with the JRE built right in. To be honest....*you* told OpenOffice.org to “take over” your Microsoft files. 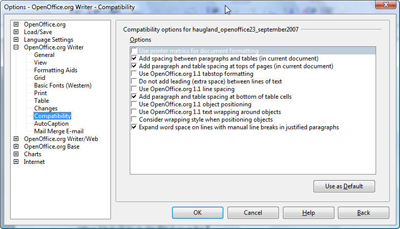 In some versions of OpenOffice.org 1.x, the default was to have Windows automatically associate OpenOffice.org with your .doc, .xls, and .ppt Microsoft files. So that when you innocently double-click one of those files, expecting Microsoft Office to pop up, now OpenOffice.org does instead. In OpenOffice.org 2.0, it is not the default, though you get the same window asking if you want that asociation. If OpenOffice.org is starting when you double-click your Word, Excel, or Powerpoint files, and you want to change it so Microsoft Office starts, here's how. The steps vary between versions of Windows so if it doesn't match exactly, keep in mind the principles are the same. Open My Computer or your Windows Explorer. Under the Tools menu, choose Folder Options. In the window that appears, click File Types. 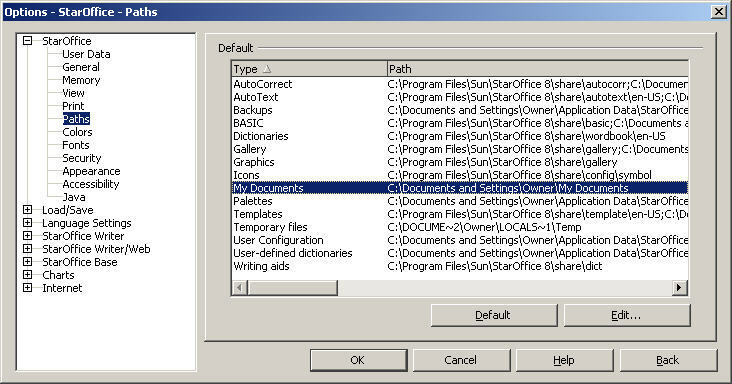 In the Extensions column of that window, find the .DOC extension that has OpenOffice.org or StarOffice next to it. Select that line in the list. Another window will appear. Find Microsoft Word. If you need to do Excel files and Powerpoint too, repeat steps 4-8. 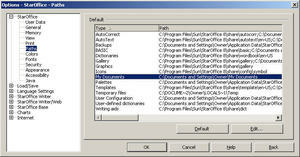 However, instead of DOC, find XLS and change it to Micorosoft Excel, and find PPT and change it to Microsoft Powerpoint. You've heard that Microsoft Office and OpenOffice.org are compatible, that Microsoft can open OpenOffice.org documents and vice versa. Well, yes. But Microsoft Office is a bit uncooperative, so you need to do an extra step to make up for it. 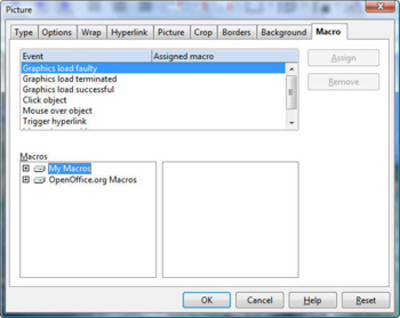 When you send an OpenOffice.org document to a Microsoft Office user, you need to save your OOo document in a Microsoft Office format. Then send that document. So for instance, let's say you've got a budget.odt document, or budget.sxw document, in OpenOffice.org. 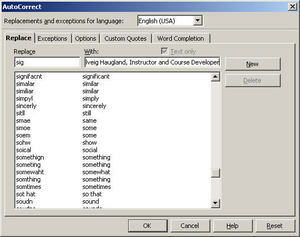 In the Save As window, click the Save As Type list and find Microsoft Word 97/2000/XP. Then write your email and attach that new budget.doc file. Send that file to the Word user. If the person you're sending the document to doesn't need to change the document, just needs to read and/or print it, it's best to send a PDF. You'll never have any formatting problems between OOo and MS because everyone can read PDFs. Just click the PDF icon on the object bar, name the file something like budget.pdf, then attach that document to your email. Why are Word documents screwed up when you open them in OpenOffice.org? 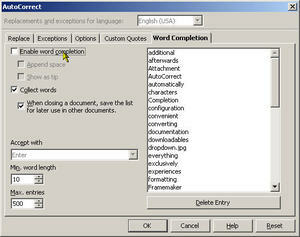 OpenOffice.org 2.0 took a lot of steps to help documents go between the two applications a whole lot better. They did some low-level coding, they changed the default margins of new documents (sometimes it's the simple things), and generally did a whole bunch of work to make transitions easier. Here are some things you can do when that's just not enough. The following illustration shows tabs and carriage returns. Text boxes can come over weird periodically. If you've got a text box that you want connected to a graphic, do this. 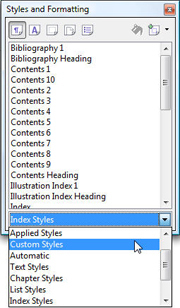 Choose Insert > Frame, click OK, and resize the frame to fit the graphic and text box. Then cut and paste the graphic inside the frame, and do the same with the text box. Rearrange them as necessary. Then the text box and graphic will stay together. Check the wrapping with graphics that aren't doing what you expect. Select the graphic, right-click and choose Wrap > No Wrap or Wrap > Page Wrap. Drag the graphic nearer to where you want it, and try adding a carriage return (blank line) above and below the graphic. Switch bullets to graphics, not fonts (normal bullets). Fonts can be a little weird. Select the bulleted list, choose Format > Bullets and Numbering, click on the Graphics tab, and select the bullets you like. Where are the reveal codes? For WordPerfect users, reveal codes are life. But with OpenOffice.org, asking for reveal codes is kind of like asking where the woodpile is. You don't actually need them since you don't have a woodburning stove. Or most of the same problems you have with WordPerfect and Microsoft Office formatting. To make something bold, just select the text with your mouse or the keyboard arrow keys, and click the Bold icon. To take off that formatting, do the same thing. If formatting is being really weird and not obeying you, select the text and choose Format > Default and start over. The key point is, select all the text you want to format, apply the formatting—and you're good to go. Why aren't there any templates for OpenOffice.org? There are a bunch, they're just not installed with it. If they're in zipped or tarred format after you download them, unzip them or untar them. Then find where OpenOffice.org was installed on your computer, and go to the openoffice.org\share\templates\en-US\ directory. 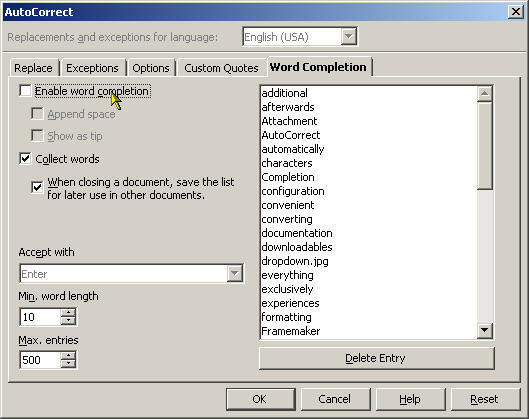 (Or instead of en-US, which indicates the language, you might find en-CA, or another directory for your language.) Copy the template files to that directory. If you want you can create a directory inside en-US such as book_templates, downloaded_templates, etc. Then choose File > New > Templates and documents, and you'll see the templates you added. 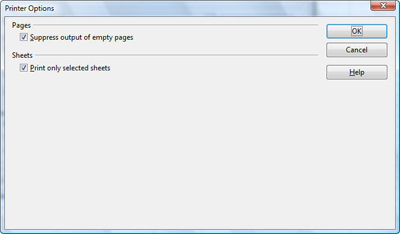 Also note that OpenOffice.org can open all your Microsoft Office templates. So just convert them to OpenOffice.org by opening them or using the batch convert tool (File > Wizards > Document Converter), then put them in the same directory noted early.